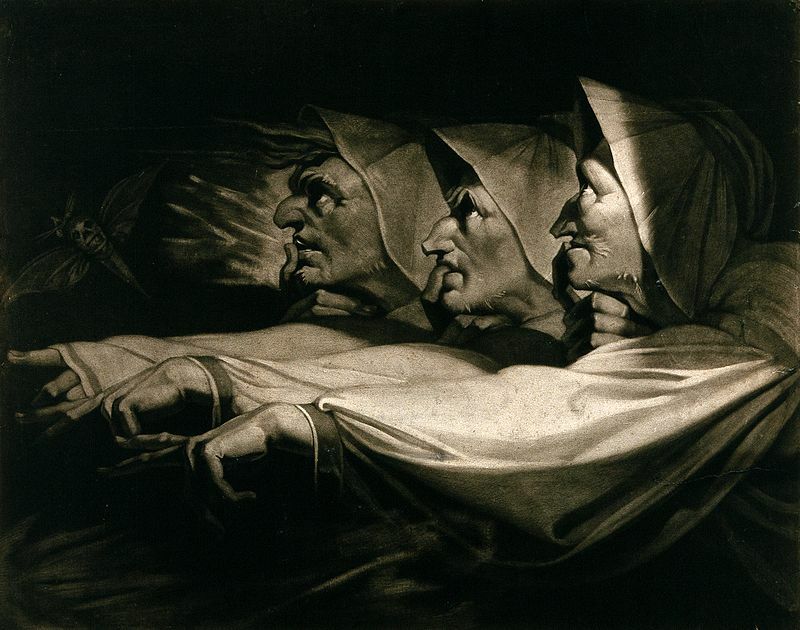 Macbeth, Shakespeare: The Three Witches. Mezzotint by J.R. Smith, 1785, after H. Fuseli, 1783. Credit: Wellcome Collection. CC BY. Macbeth is the first major work of Almost Tangible, a new audio production company. Produced by Charlotte Melén and directed by Carl Prekopp, this free podcast of Shakespeare’s play seeks to bring the listener ‘immersive soundscapes’, which are best experienced with headphones. Between the recording on location at Glamis Castle and the compelling performances of a talented cast, Almost Tangible’s Macbeth is an excellent production. The medium places the emphasis on relationships and dialogue, which are often lost to the violent visuals of most film versions and some theatre performances. Importantly, the podcast resists the temptation to over-sexualize Lady Macbeth as has been done in recent adaptations, such as the 2015 film, directed by Justin Kurzel and starring Michael Fassbender and Marion Cotilliard. Reflecting the current political climate, the podcast draws attention to the importance of women in the play, which is also in keeping with what we now know about the real lives of elite women in medieval Scotland. The depiction of Lady Macbeth in this dramatization brings to life a woman who is involved in public life and exercises personal agency in political events. Her early soliloquy in Act I emphasizes that the castle is as much hers (‘under my battlements’) as it is Macbeth’s. While Shakespeare took quite a few liberties with historical accuracy, the relationship between Macbeth and Lady Macbeth seems to have some root in historical fact. Andrew MacDonald emphasizes in his biographical entry in The New Biographical Dictionary of Scottish Women that, while Lady Macbeth is certainly one of the most famous women in Scotland’s history, not much is actually known about her. Her real name was Gruoch and she was either the daughter or grand-daughter of Kenneth III, king of Scots. According to MacDonald, she was first married to Gillecomgain, the mormaer of Moray, and later to Macbeth, who may have been involved in Gillecomgain’s death. MacDonald has suggested that her marriage to Macbeth may have been an attempt to mitigate enmity between clans. Unlike the events in the play, Macbeth ruled for some time in Scotland, and was succeeded by Gruoch’s son, Lulach. Importantly, Gruoch seems to have had an active role as queen of Scots. MacDonald has pointed out a number of joint charters issued by the couple. In this way, the play perhaps accurately portrays the partnership between the ruling pair, even if their intentions seem to have been less murderous in real life. This is where my own research crosses over with Shakespeare and the historical Gruoch and Macbeth. In my investigations of women’s charters from 1296 to 1458, I found that women’s activities as wives were the most of any relational category (the others being ‘daughter’ and ‘widow’). This confounds notions about coverture (in England) or guardianship (in Scotland) during marriage, whereby wives were subject to their husbands’ protection and authority. Quite the contrary, women often intervened in local, and sometimes national, politics. Traditional gender roles have always been somewhat confounded by the women in Shakespeare’s play. On Macbeth’s first encounter with the weird sisters, he remarks ‘you should be women, and yet your beards forbid me to interpret that you are so’ (I.iii). Two scenes later, as Lady Macbeth prepares to undertake their treasonous business she declares ‘unsex me here’ (I.v), suggesting that her femininity is at odds with committing murder. However, Shakespeare’s female characters do not transgress gender. Rather, they are, or become, ungendered. In Almost Tangible’s production, the audio performance results in a contextual loss: we (literally) can’t see the gender ambiguity of the weird sisters. To counteract this, perhaps, more roles are assigned to women. Thus the smaller roles of the Messenger, Porter, ‘Old Person’ (an old man in the original play), and Seyton are all portrayed by female actors. The Porter, in particular, when portrayed as and by a woman, gives the play a more feminist, and modern, sensibility. The audio performance is divided into four parts. ‘Macbeth Part 1 Sleep No More’ covers Act I to Act II, scene ii of the original play. ‘Macbeth Part 2 Things Bad Begun’ takes the listener from Act II.ii to Act III.iii. ‘Macbeth Part 3 In Blood Stepped’ is the shortest of the installments, covering Act III.iv to Act IV.ii, with Act III.vi-vii cut from the dramatization. The final installment ‘Macbeth Part 4 Turn Hellhound’ provides the dramatic conclusion to Shakespeare’s tragedy from Act IV.iii to the end of the play. The re-division of the play into the four parts works probably works better than the original division of the acts for the podcast format. Parts 1-3 each end with death: Part 1 ends with Macbeth killing King Duncan; Part 2 ends with the killing of Banquo; and Part 3 ends with the murder of Macduff’s wife and children. This dramatic re-division also emphasizes further the importance of the female characters to Macbeth. For example, Part 2 begins with a monologue from Lady Macbeth and the ending of Part 3 emphasizes how much women drive the plot forward. As in the original play, Lady Macbeth is instrumental to the central actions and the bloody conclusion is, in part, a manifestation of Macduff’s grief. In summary, Almost Tangible’s podcast production offers a contemporary, feminist, take on Macbeth that, coincidentally, reflects with more accuracy the very real power enjoyed by aristocratic women in medieval Scotland.